From "Democracy Now" with Amy Goodman. Early voting in the presidential election has already begun in many states, and problems are already emerging at the polls. In West Virginia, voters in at least two counties using touchscreen voting machines have claimed their votes were switched from Democrat to Republican. Six voters reported having this problem in Jackson and Putnam Counties. In both counties, Republicans are responsible for overseeing elections. One voter, a retired nurse named Shelba Ketchum, said, "I hit Obama, and it switched to McCain. I am really concerned about that. If McCain wins, there was something wrong with the machines.” Election officials blamed voters for not being more careful. Both counties use machines made by Election Systems & Software. New song by Gary Polvinale about Ohio election fraud, "In Ohio"
Madog Pavanelli & the Virtual Country Boys light out after Main Street in our new song .... "In Ohio". This music tells an important story. Copy and distribute freely. 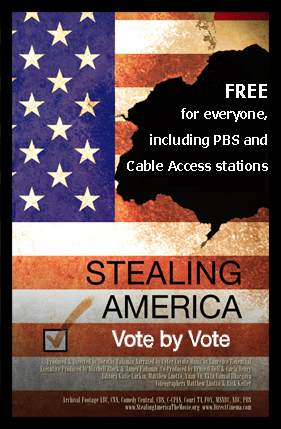 Dorothy Fadiman invites the public to make free downloads of "Stealing America: Vote by Vote"
FREE to view, FREE to download! Inconvenient Truth did for global warming." Why is this film a "must see"? 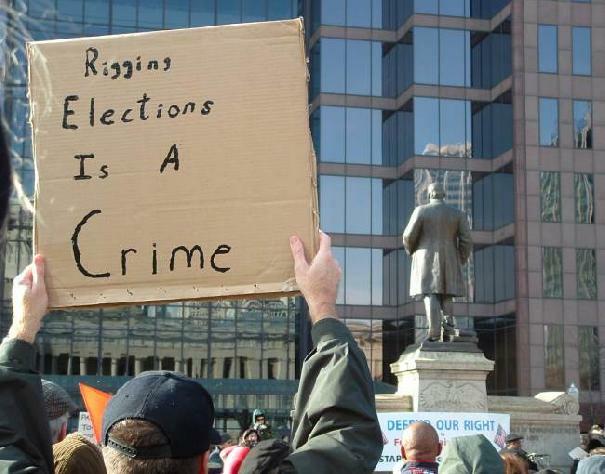 that recent national elections were stolen. PBS, Cable Access or Community TV stations? STEALING AMERICA (starting October 21) can do so. plus whatever permissions you require. We have just learned from Rachel Sterne of the great worldwide citizen journalism site, GroundReport.com, that, through the "Video Your Vote" project sponsored by YouTube, they are looking for people in states other than California and New York to video their vote this Election Day, in exchange for a free, brand new Flip camera. Immediate response would be greatly appreciated.